NEW YORK -- CiCi Bellis looked at her dad and coaches for help. The look of wonder and disbelief had not yet faded Tuesday from the 15-year-old's face after becoming the youngest winner at the US Open in 18 years and youngest American in 24. That she defeated the tournament's No. 12 seed, the 2014 Australian Open runner-up Dominika Cibulkova, who was ranked 10th in the world in March, made everything else at this moment irrelevant. CiCi Bellis was born in 1999, the year Serena Williams won her first US Open title. "What was my biggest win before this?" she asked her father, Gordon, USTA national coach Leonardo Azevedo and Tayler Davis, her coach from home in Atherton, California. Bellis had, after all, just come off the USTA Girls' 18s national championship (which gave her a wild card into the US Open) with a win no one had expected over Tornado Black, the 2013 US Open juniors runner-up. Bellis also had won Les Petits As, a prestigious junior tournament in France, last year and finished as a runner-up in doubles in the French Open juniors. But the fans were five and six deep around Court 6 here Monday in the first round, the crowd growing as word of her match circulated through the grounds. New York tennis fans chanted Bellis' name after she won the first game of the third set against Cibulková, then just as quickly lost the next three. At that point, said the kid who rarely gets nervous, she got into the moment. "It gave me so much energy," she said of the crowd. "I love that. I love when people watch me." She also had a little talk with herself. "Well, yeah, when I was down 3-1, it was kind of a bummer. ... I just kind of told myself, 'Calm down. Don't think about who you're playing, who is on the other side of the court. Just be free. You have nothing to lose,'" said Bellis, who closed out the match 6-1, 4-6, 6-4. Bellis, who will next play Zarina Diyas of Kazakhstan in a second-round match on Thursday, did not come out of nowhere. She is not in the same mold as Mo'ne Davis, the 13-year-old who took over the Little League World Series last week, but rather a junior tennis player of considerable merit. But like Mo'ne, Bellis has an appealing innocence about her, a girl who's going to be a sophomore in her home-school curriculum, and, giggling through her news conference, acts like it. Among her first words after the match, "Oh my gosh, I've never drank so much Powerade in my life." So baby-faced is Bellis that an Italian reporter asked about her hobbies: "You read books or watch cartoons?" And when a California reporter asked where she liked to hang out at home, she replied, "Stanford mall or something like that." Asked to elaborate, she replied "Urban Outfitters." And like Mo'ne, in the surest sign of overnight fame, CiCi (short for Catherine Cartan, her grandmother's maiden name) broke into a shy grin when told she was trending on Twitter. "I know some of my friends were doing hashtag like 'takedowncibulkova,' something like that," she said. "I know three of my friends did that." Bellis would have won $60,000 for the first-round victory but explained patiently why it was easy turning it down. "I think I'm definitely going to stay an amateur right now to keep my options open for college, in case an injury or something happens," she said. "But I'd love to be a pro one day." Azevedo described CiCi's strengths as "her aggressiveness from the baseline, a great forehand, a great mover and great competitor. 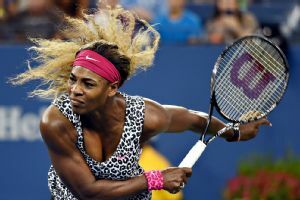 Her presence on the court is not normal for a 15-year-old." No, normalcy comes off the court, with her parents -- dad Gordon, who works for a private equity fund in San Francisco, and mother Lori, who played junior tennis and then at Indiana University, but stayed in her New York hotel room Monday, too nervous to come to the match. It gave me so much energy. I love that. I love when people watch me. It was left to Gordon to answer questions. Asked about his role, he said, "I carry bags and pick up balls." His daughter takes a day off from tennis about once every 10 days, he said, though he'd like it to be closer to once a week. But like most dads of teenage daughters, he has only so much say. "I'm told I cannot sigh and cannot move or say anything," he said of his daughter's instructions during matches. "She knows when I sigh. I have to sit like a sphynx." If you forget how young 15 is, you are quickly reminded when Bellis says her first memory of the US Open was when she was 6 or 7, watching Maria Sharapova play. That was 2006. At that point she played soccer and tennis. At 10, she chose tennis. "That's when I really focused on practicing a lot, practicing really hard to get to this point and everything," she said. She did not, however, expect this. "It's crazy to think I'm actually here right now with all these other people," Bellis said. "I mean, I never thought I would be practicing or sharing a court with, you know, a player I watch on TV. I mean, it's crazy. But I love it."